This entry was posted by Martha on Saturday, May 18th, 2013 at 10:39 am and is filed under Photography. You can subscribe to responses to this entry via RSS. so how close were you or was that the lens sneaking up? more incredibly vibrant colors. Nice eye, Martha, although with those colors I do wonder if anyone could miss it! I was just a few feet away… if that. I was using the 50mm lens, which doesn’t have any zoom capability. When we arrived home, the bird was actually sitting on the sidewalk. When Tom opened the front door it hopped into this bush for a picture. A man stopped and watched as I photographed it, and he thanked me for having noticed it as he wouldn’t have on his own. It was a neat moment! 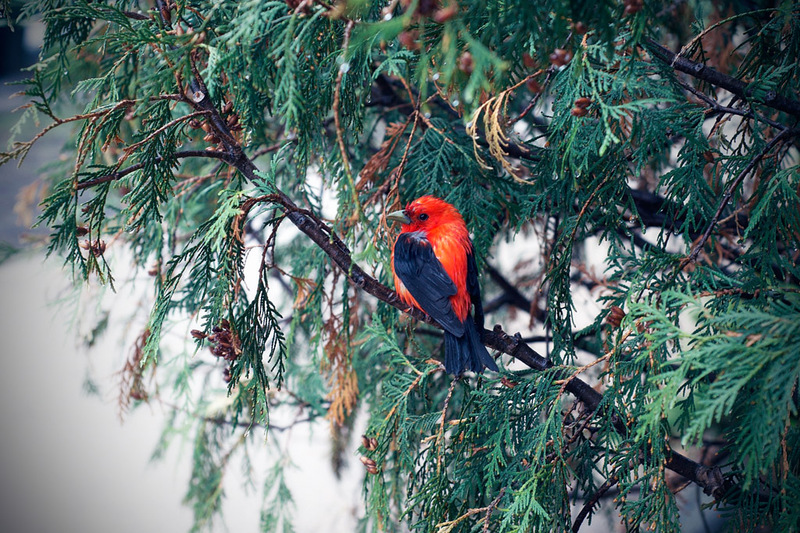 Scarlet tanager spotted at the Benmark this weekend!